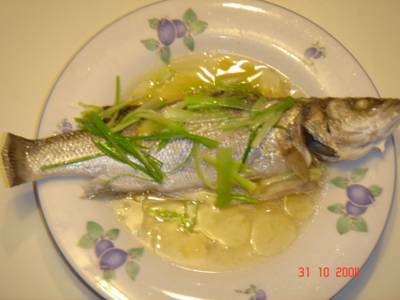 This is one of the simplest and most subtle way cooking a fresh fish. By simply steaming it with just enough spicings to bring out the best in the succulent and juicy fresh fish you can find. It will be very hard to hide inferior quality fish since there are no heavy seasonings or sauce to cover it. This has to be eaten right after it comes out of the wok. It does not reheat well. Apologies for the plate I used since I do not have an oval plate. When I instructed my husband to buy fish and the plate, he refused to buy the plate saying that it was 3 times more expensive than the fish! If the fish was any bigger I would have cut it in half to fit. It is ideal to have a plate that will mimic the shape of the fish in order to catch all the fish juices. Besides it is easier to lift an oval one from the wok than a round one. I used sea bass for this but almost any white fleshed fish can be used here - lapu-lapu (grouper), pampano (pomfret), karpa (carp), and others. [Optional] Cut two diagonal slits on each side of the fish. Mix marinade ingredients on a plate and marinate both sides of fish for about 15 minutes. Put about 1 1/2 cups water in a wok and bring to boil. Once it boils, put the steamer in the wok and put the plate with the fish on the steamer. Cover and steam over high heat for 15 minutes. About 3 minutes before cooking is up, heat the 2 Tbsp oil until smoking hot. Remove plate from the steamer, sprinkle the other shredded green onion, pepper, and sesame oil on the fish. Pour hot oil over it (be careful this might splatter). Serve immediately. I Can't Believe There's No Butter !